Shopping in Phnom Penh is a truly unique experience, different from the Malls of Asia. So there is one Mall, Aeon, and it is decent. And if you want to buy products unique to Cambodia, you are not going to find them in a Mall patterned in downtown Bangkok. If you only have time for one shopping experience, go straight to the Russian market. But, do collect your $200. In there, you will find a chaos of stalls that sell souvenirs and Cambodiana. The alleys are narrow, the noise is all around you, it is hot but it is a great experience and a real piece of Asia that tourism has not ruined yet. You will find several NGOs selling their products there from bags, to scarves to accessories especially those made of silver. ​Aside from the local products, many of the over runs or rejects from the garment factories and even the fabrics they have not used find their way to the market so branded products are everywhere though you have to be careful as many of these maybe fakes. Mind you, brand new Rolex for $12 is not a bad deal. Foreigners love this market better. The aisles are bigger than the ones in the Russian Market so you can rummage around here for clothese, shoes (lots of these in the shoe alleys), souvenirs, food, and houseware. Inside the Art Deco Rotunda, you can find watches, speakers, phones, sunglasses and jewelry the provenance of which I cannot tell you. For fabrics, they are often designer tagged and if you like one, don't go any further. Many of these are ends of fabric rolls from factories. Haggle and buy as most likely, you will not find these when you get back there. Except, of course, for fabrics hand woven in Cambodia which range from cotton to silk or organza. The silk may not be of the same quality as the Thais but they have their own beauty and unique weave. There are several other markets you can explore such as the Night Market, O'Russei and Kandal. There are also smaller ones and for local colour, much more interesting. ​If you have more time, hit Street 240. Lined up there are stores that sell NGO products. There is evidence of more modern designs in clothing and accessories. Of course, it is more expensive than Russian market. Water Lily has well-designed accessories. The owner and designer, Christine Gauthier has lived in Phnom Penh for years and has sourced the local markets for things she puts together into amazing designs. Wattan also sells clothes and will customise these for you. It is right beside A.N.D. They have a great selection of practical women dresses, tops and accessories. They can also tailor outfits for you in a day if you're in a hurry. Call: 012-492-093. Visit their website to see other products as well as know about them. Bliss offer well designed modern cotton and linen clothes. This is often referred to as the Art Street. Lined up along each side are stores selling some really interesting paintings. In some of them, you will find the artist doing his work. 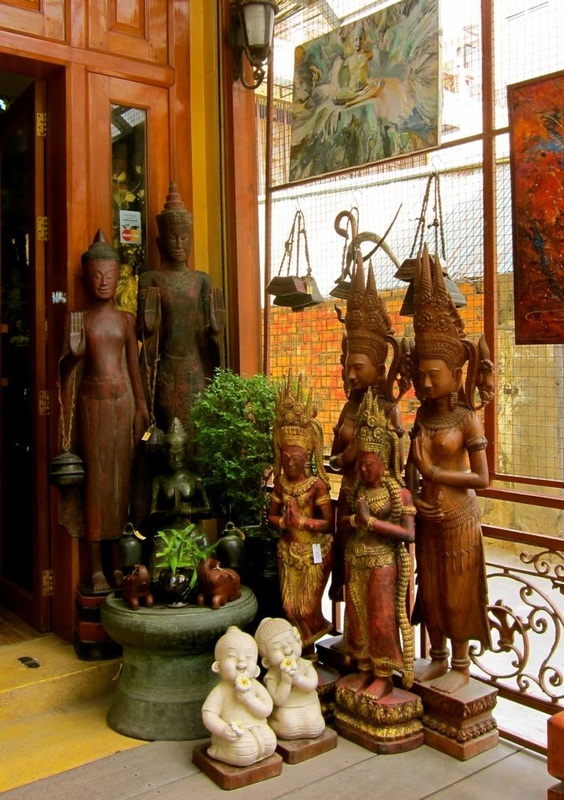 Aside from painting, several of the stores make and sell traditional sculptures. In fact, along the street, you will find some wood artists doing fine and beautiful work. St. 178 has also many small boutiques that sell silk accessories. My two favourites are Happy Silk and Ta Phrom and a big smile will greet you as you enter either. Further on St. 178 is Ambre (House #37), the boutique of Romyda Keth, the famous Cambodian designer. Here you can find clothes and accessories for special occasions. The store has also a section for home decor. There is, of course, the BKK1 area, the home of all the consulting community after the Pol Pot era. 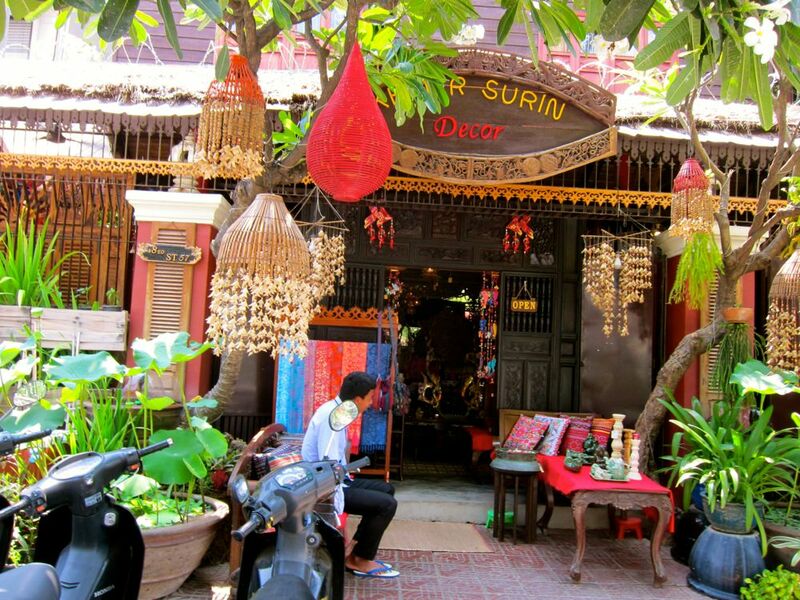 St. 63 has the Khmer Surin store with colourful cotton clothes and accessories for your self and for your home. Smateria has beautifully designed bags made of netting material and old flour and rice sacks. In BKK is St. 278 and there are tiny boutiques here like Luna where they display linen and cotton clothes at reasonable prices. They can customise whatever designs attract you. You can also bring your own fabric and design or choose from their own stock of fabrics and they will make it for you. Bring one of your favourite dresses from your wardrobe and have them make you another in a local fabric. 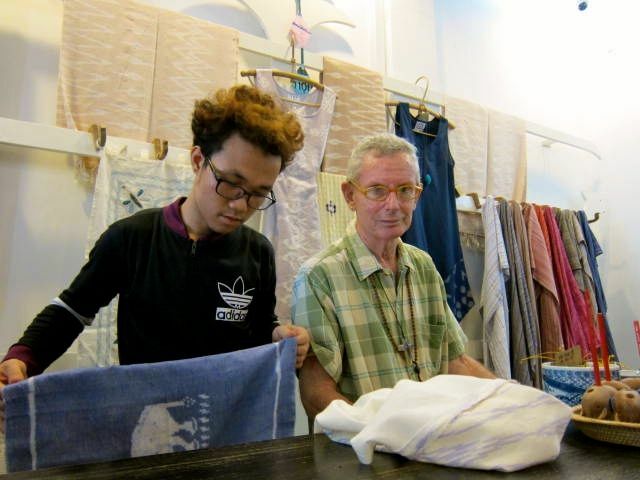 In BKK, in St. 51 is Tabitha (#239), an NGO that has worked in Cambodia for years and has designed products from silk woven by those in the villages Tabitha supports. Products range from bags to wallets, scarves and other home accessories. 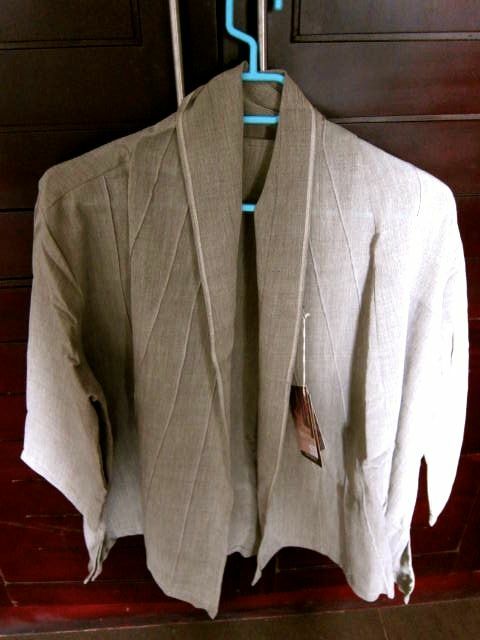 For hand woven fabric, natural finer and dyed naturally, visit the Goel Community display in #206. St. 12 BT, Sangkat Boeung Tompun, Khna Meanchey, Phnom Penh where you can buy products made from these fabrics. Products range from baby's clothes, sheets and other home products, men's and women's clothes, scarves and slippers. For recycled products, go to the workshop of SmartCraft by contacting 012 63 39 38. For samples of their products, go to Facebook: SmartCraft. Here's a display in their workshop. The designer and producer are there so you can bring your own unique design. Products range from wallets and bags made of recycled tires. recycled paper, rice and cement bags. You can also call them to bring products to your hotel. In front of the National Post Office is Artisans d'Angkor where you can get the highest quality silk and traditional Cambodia carvings. You may have to pay more but the quality of the products is exceptional. There are so many more stores in Phnom Penh selling products that are worth bringing back. Beyond those, is the night market and the other local markets where you can haggle yourself to hoarseness and get bargains that will bring tears to your eyes when you finally get home. 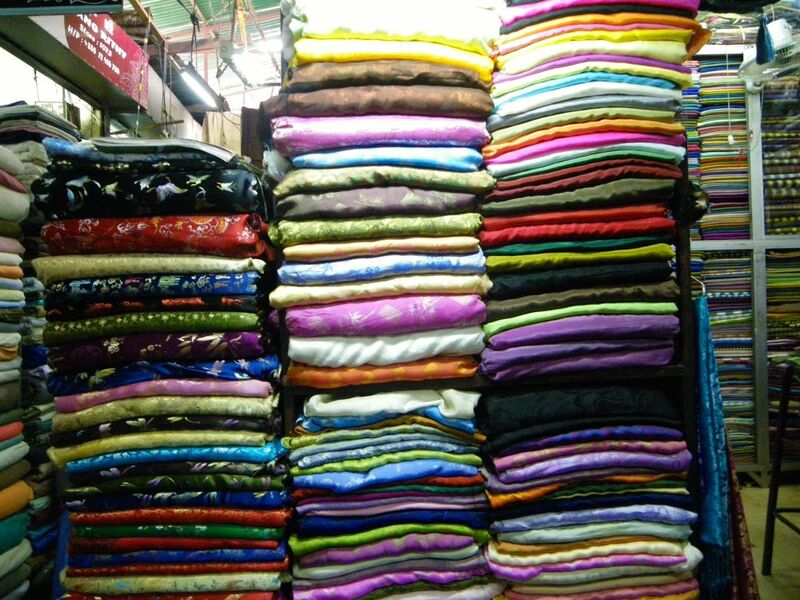 If you love silk and want to buy more silk fabrics, visit Silk Island. It is not far from Phnom Penh and tours are many so you can visit with the ones who weave the fabrics. It is a wonderful experience and will build a story around your purchase. You can go there on your own by taking the ferry. You will find the terminal at the back of the Himawari Hotel. Once you get to the island, you can rent a motorbike or tuktuk to take you to the weaving places. This part of Phnom Penh is still rural and the ferry ride is quite an experience. For other artisan products in Cambodia, visit the showroom of the Artisans Association of Cambodia at House # 12C, Street 105, Sangkat Beung Trabek, Phnom Penh. Tel. 855 23 213 904.